Is there a better alternative to Graffiti? Is Graffiti really the best app in Email category? Will Graffiti work good on macOS 10.13.4? Note: Graffiti is no longer for sale. Its functionality is now included in Feigeist's MailButler, whose link can be found int he following paragraph. Graffiti--which is now a part of MailButler, the complete assistant for Apple Mail--makes it easier than ever before to design wonderful email signatures without being a web design expert. Add Style to your Emails - Email signatures are a very effective way of making your email messages look more professional, more personal or simply more beautiful. With Graffiti it becomes easier than ever before to design wonderful email signatures without being a webdesign expert. Be unique - With Graffiti, you are able to design your email signature without any limitations. With HTML and CSS you can even re-use parts of your personal or professional website. Include hyperlinks to websites, social media profiles or personal images. Use Templates for your Corporate Design - Graffiti supports templates to define a common look of email signatures within your company. You can easily design your own template and use them on different computers. 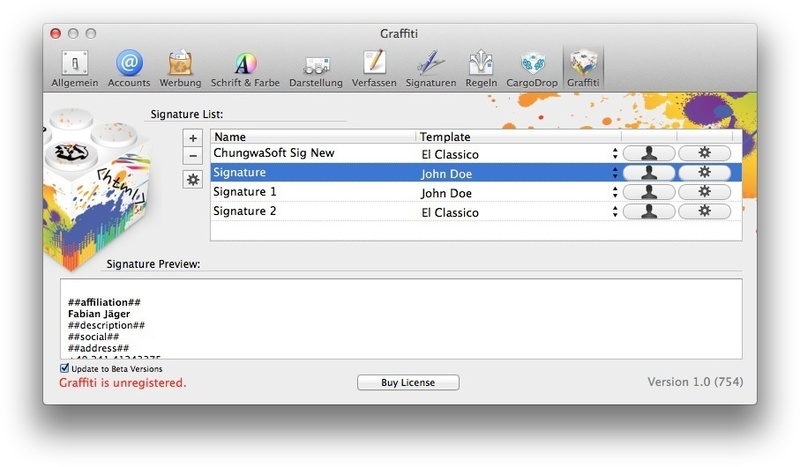 Graffiti will automatically fill in the particular user's personal information while retaining a common design based on the signature template.